The annual spring plankton bloom (apparently mostly barnacle larvae) began here in Connecticut a couple weeks ago. 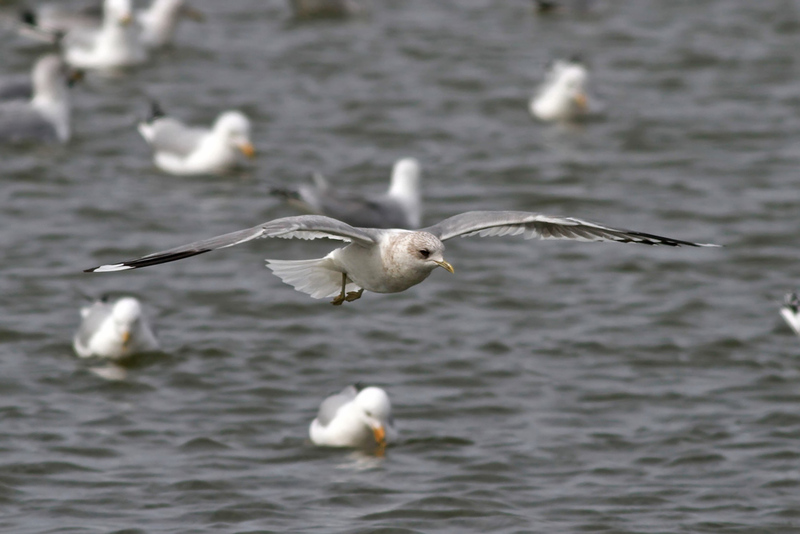 This event, which takes place during March through mid-April with varying degrees of intensity, is a magnet for gulls and sometimes waterfowl. 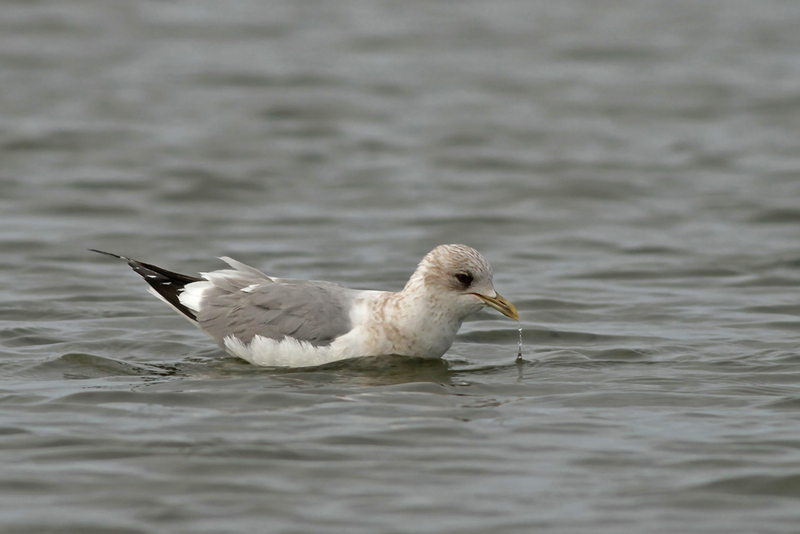 Along the rocky central and western CT coast of Long Island Sound the birds sit on the water’s surface and actively pick at the abundant larvae that surround them. I have yet to observe the larvae from a boat, but I have heard from others that the bloom can be impressively thick at times. 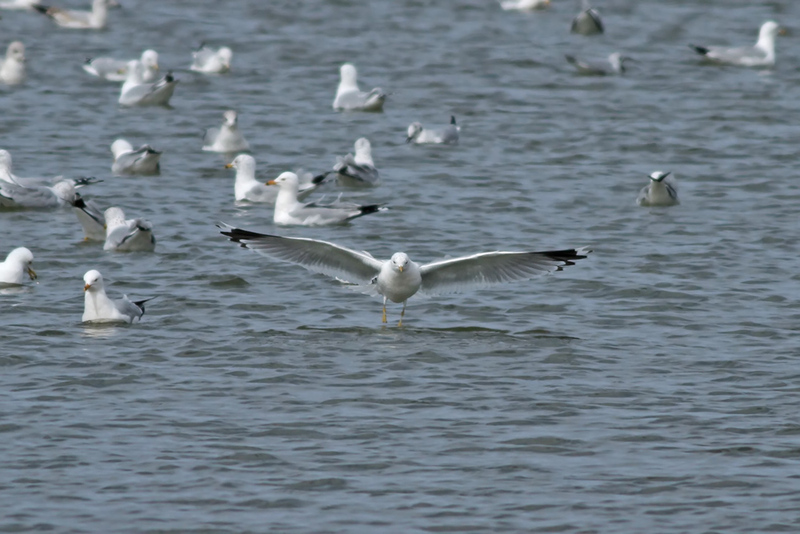 Sometimes the birds are concentrated in tight flocks, while other times they are rather spread out. These flocks are very mobile and can move west-east or onshore-offshore in the blink of an eye. 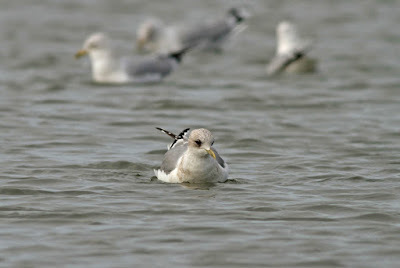 It is a very hit or miss type of birding. 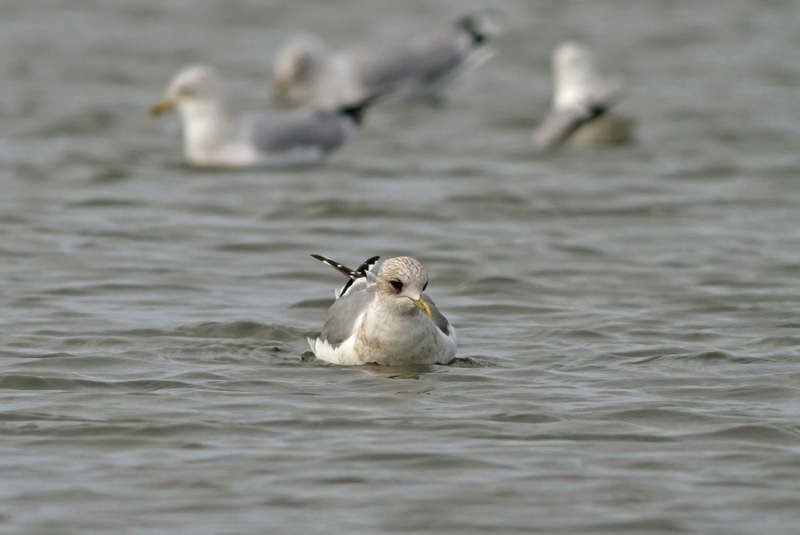 And if you do find the flocks, they may be too far offshore to study closely. 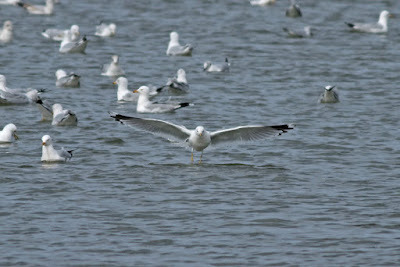 But when you do “hit,” the gull show can be spectacular. With the recent closure of the last bulk-waste landfill in Connecticut, this event is our best shot at large concentrations of gulls in the state. 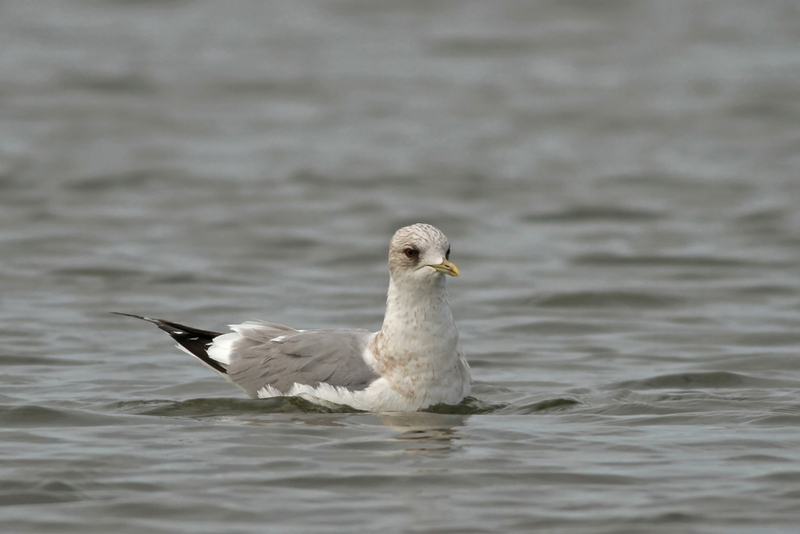 We have no reliable major river roosts (though Southbury along the Housatonic River can be quite good), no commercial fishing industry, and no open ocean. 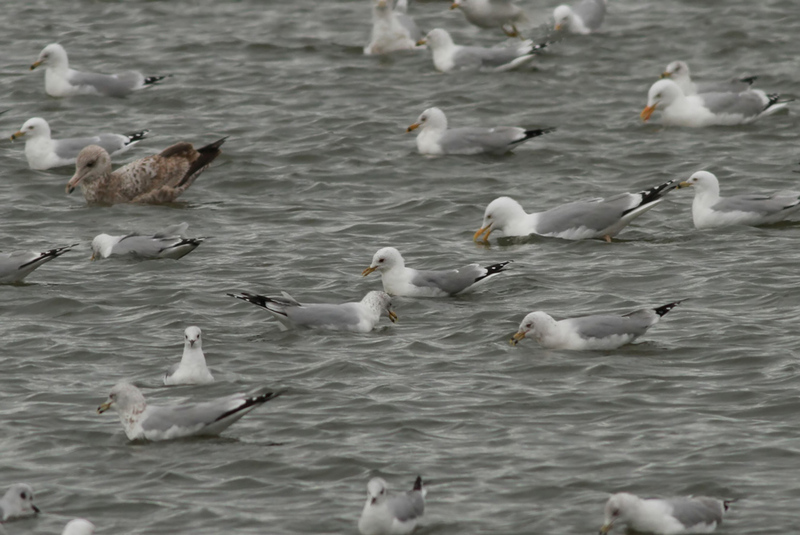 The plankton-associated flocks, however, can be impressive with several thousand birds in view at once during peak activity. 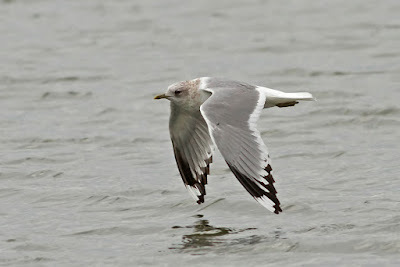 Any gull is possible, except probably the pelagic species like Sabine’s Gull and Black-legged Kittiwake. 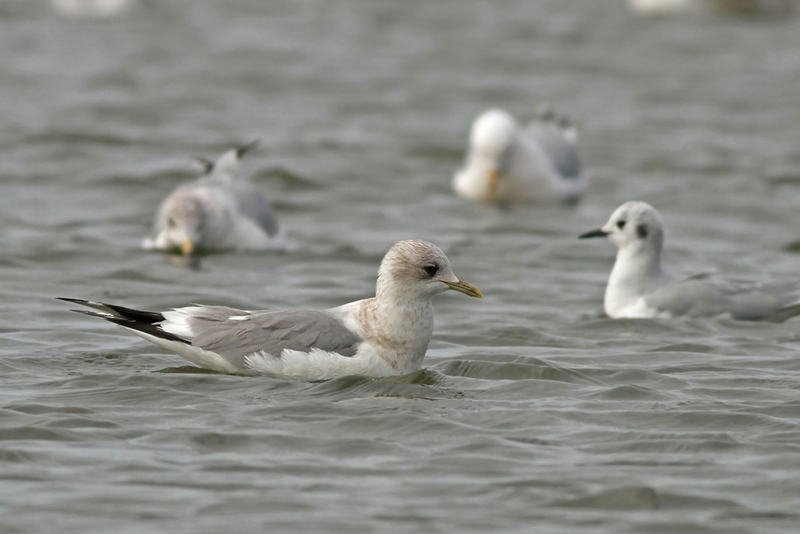 Birders have really caught on to this phenomenon over the past several years and have been working the gull flocks pretty hard. 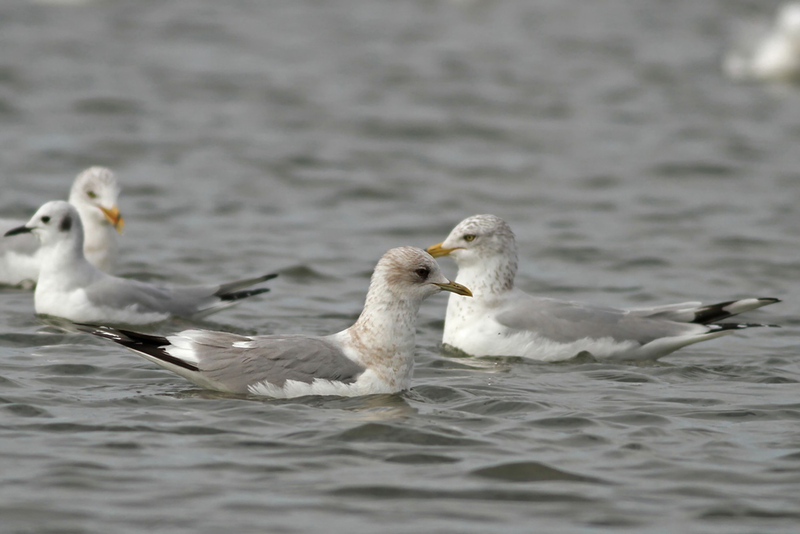 Easily a dozen gull species have been recorded participating in the feast, including Black-headed, Little, Thayer’s, and now three forms of Mew Gull (Common, Kamchatka, and Short-billed). 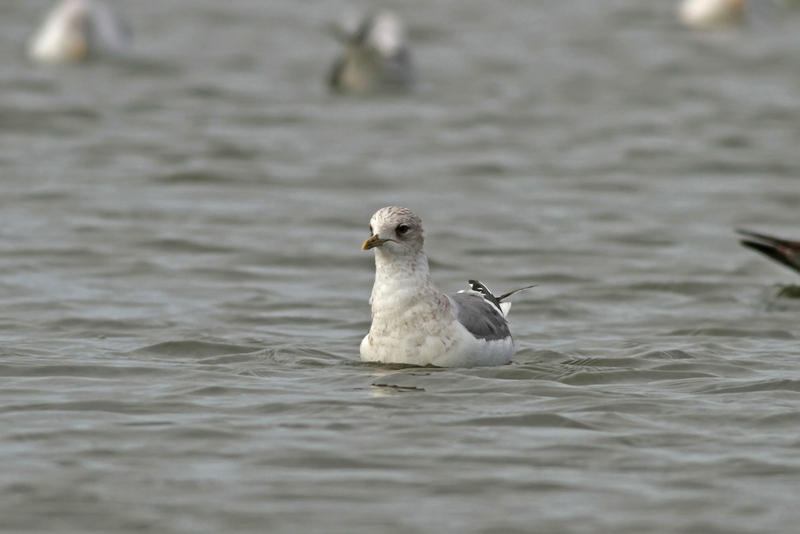 The state’s lone Ross’s Gull, seen in April 1984 at a time of year and location known for heavy plankton feeding, might have taken part as well. 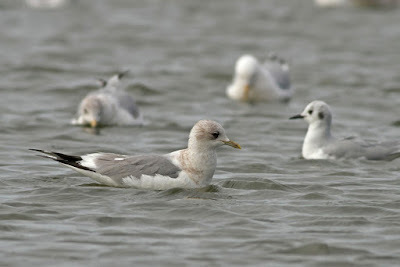 Several more species are possible. 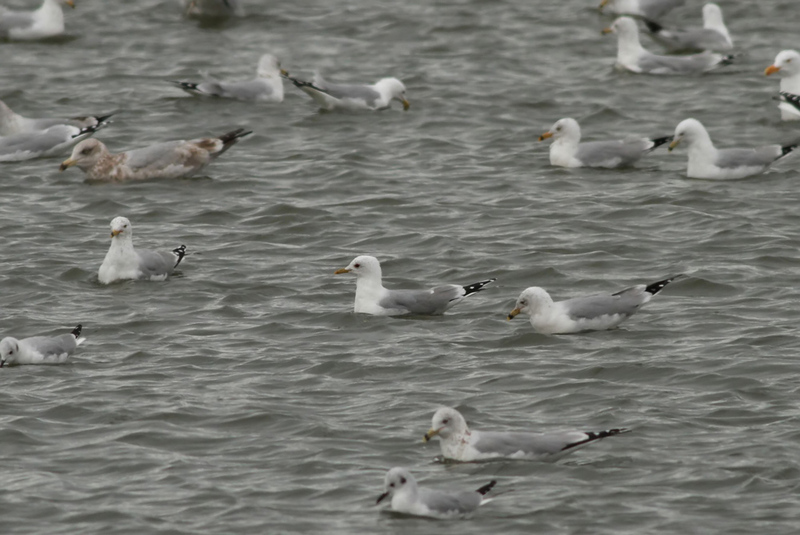 The bloom so far this year had produced decent numbers at a few scattered locations, but diversity remained quite low (white-winged gulls in particular have been rather scarce all winter). 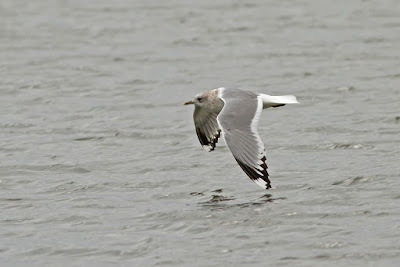 This began to change over the past few days with a slight uptick in reports of Iceland and Lesser Black-backed Gulls. 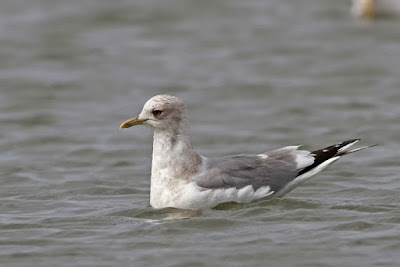 The Fairfield-West Haven coast had been birded pretty heavily over the past few days, so this morning (March 20, 2016) I decided to look further east, starting with Hammonasset Beach State Park in Madison. Straight away I noticed a flock of plankton-feeding gulls directly off Meigs Point. 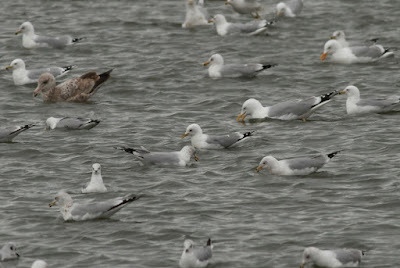 The flock was predominantly Ring-billed followed closely by Bonaparte’s and then Herring. 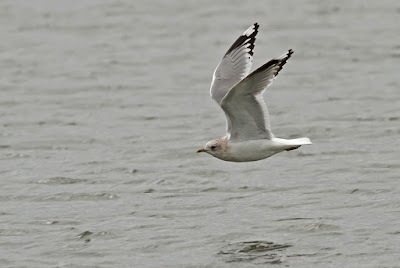 Within an hour I scoped an adult Mew Gull on the water that looked good for “Common” Mew Gull based on first impressions. 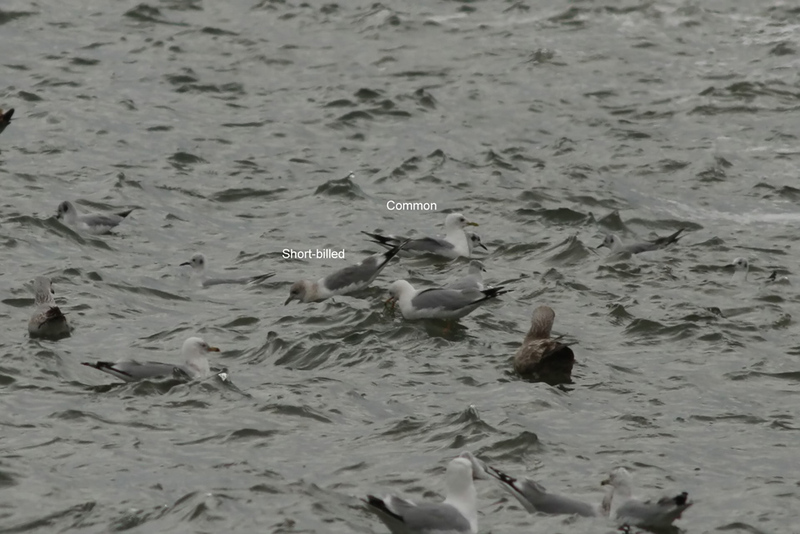 That bird flew with the rest of the flock towards the other side of the jetty before I could confidently identify it to subspecies. 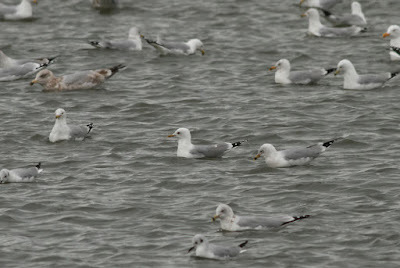 There were a few thousand birds on the water, all now close enough to shore to study quite well via scope. One of the first birds I picked up on was a Mew Gull rather close to shore. 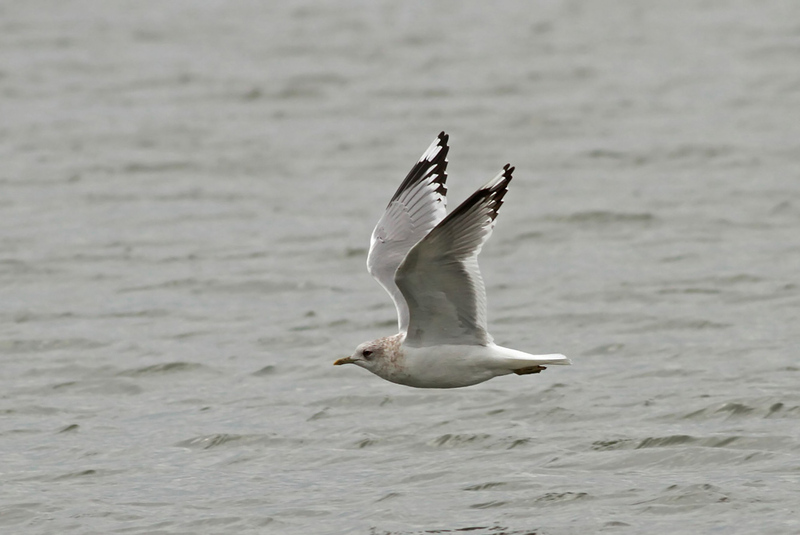 This bird looked darker-mantled and was more heavily marked on the head/breast than I recalled from a few moments earlier, but that initial view was somewhat distant and brief, so I thought it more likely that I misinterpreted field marks from a distance rather than there actually being two Mew Gulls present. Closer inspection of this bird revealed it to be a pretty classic-looking “SHORT-BILLED” MEW GULL (Larus canus brachyrhynchus), also known as North American Mew Gull or just Mew Gull. The English nomenclature can be a bit confusing, so it is much easier to use to Latin names for these forms. 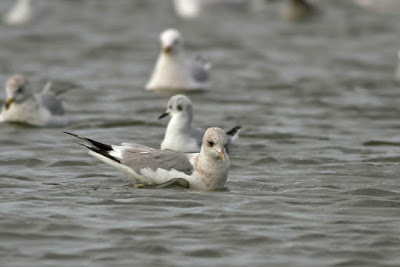 The bird was small overall with a particularly long neck and small head. 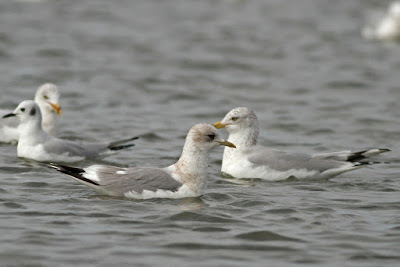 It showed gray upperparts a couple shades darker than Ring-billed Gull, a medium brown iris, a thin greenish-yellow bill with faint subterminal markings, a streaked crown with smudgy brown markings on the neck/breast, and a whole lot of white in the primaries. 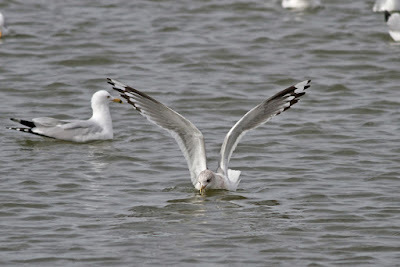 In particular, p8 had a large white tongue-tip and the trailing edge was quite broad even through the inner primaries. 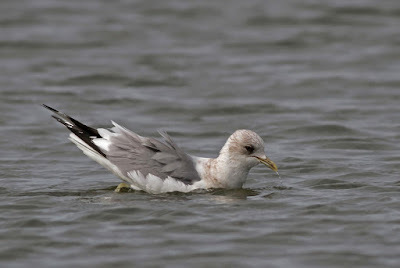 Folks began to arrive to view the bird, and the more I looked at this pretty obvious brachyrhynchus the more I thought that this was not the first Mew Gull I had scoped earlier. Sure enough, a bit of flock scanning revealed the original Mew Gull, this one an adult “COMMON” MEW GULL (Larus canus canus) of Europe. 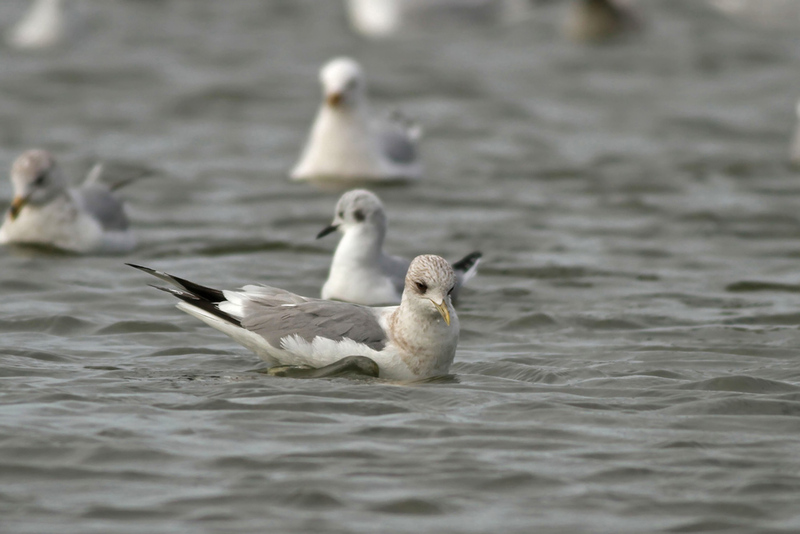 This bird was nearly in alternate plumage with a white head & breast (save for some sparse crown/head spotting) and a brighter yellow bill. 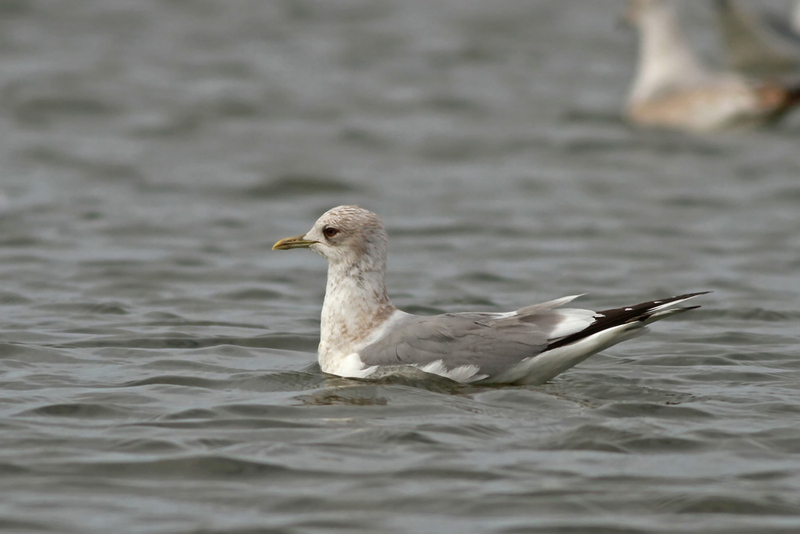 The upperparts were much closer in shade to Ring-billed Gull thus making this the more difficult bird to pick out from the crowd. 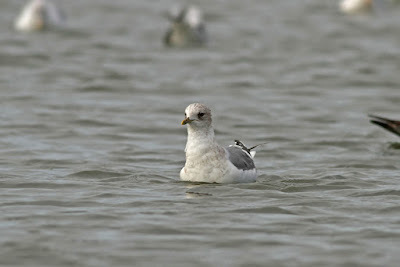 Its blackish beady eye stood out well on the white head. 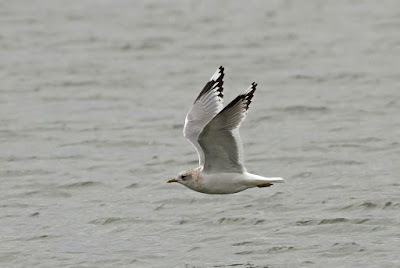 In flight, this bird showed much more black in the outer primaries including a total lack of white on p8 except for the tip. The white trailing edge narrowed considerably at the inner primaries, a trait that fits the Eurasian forms but not Short-billed Mew. 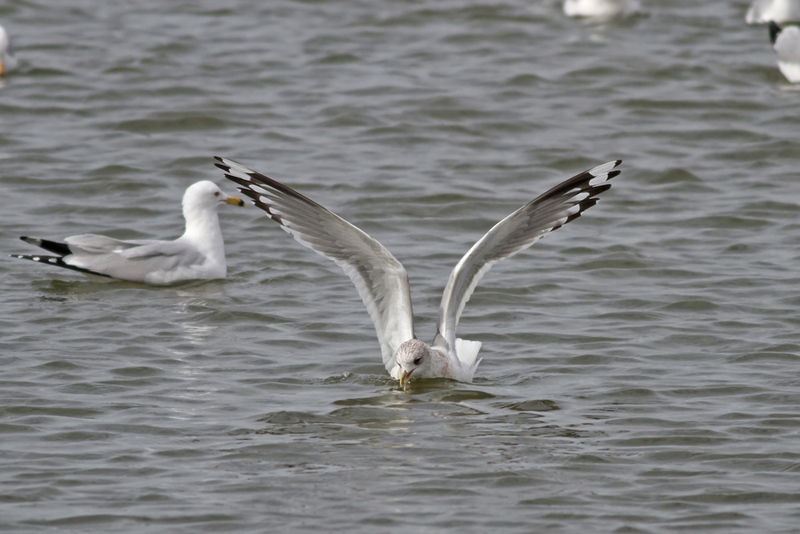 The two Mew Gulls showed no interest in joining one another. 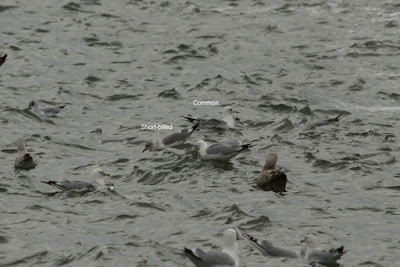 Only for a period of about one minute during several hours of observation did the two birds cross paths. Many birders were able to see both birds thanks in large part to the group of dedicated observers who were constantly relocating them among the always-moving flock. 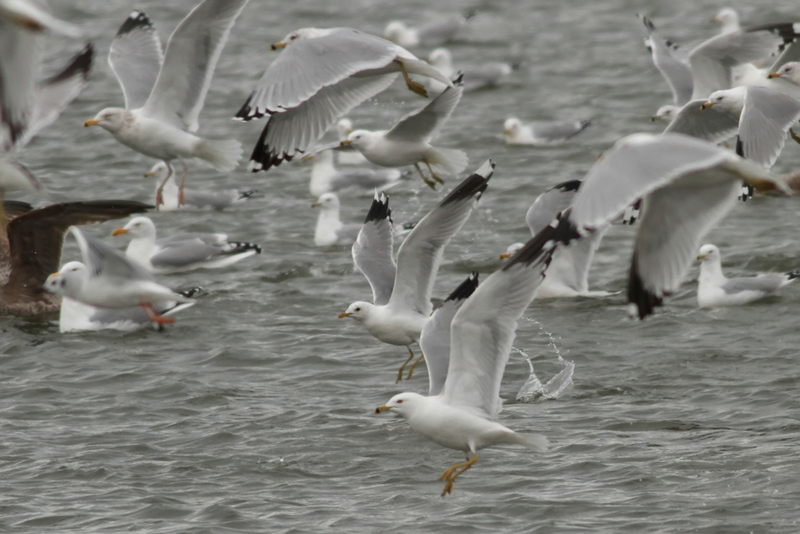 It’s not easy to simultaneously pin down two widely-spaced birds in a flock of a few thousand hyperactive gulls, yet everyone chipped in to get it done. 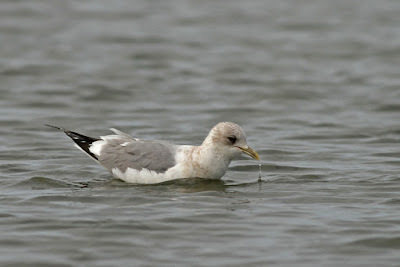 Mew Gull has occurred in Connecticut eight times, counting these two birds. 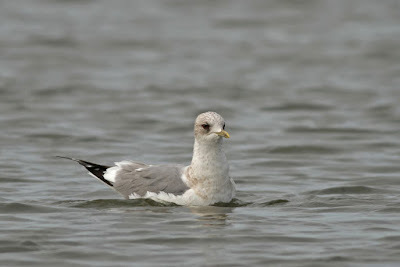 The first two state records were sight records not identified to subspecies, “Common” Gull has occurred four times, “Kamchatka” Gull once, and “Short-billed” Gull once.